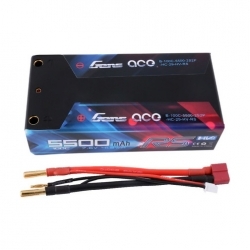 Gens ace 5500mAh 7.6V High Voltage 100C 2S2P HardCase Lipo Battery 29# fits for both 1:10 off road stock and modified class. Also, they fit 1:10 Formula model and 1:10 Professional Drifting model EFRA & BRCA legal. Suitable model: XRAY XB4/XT2/X1, TLR 22, Serpent Spyder/F110, Team Associated B6/F6 and so on.